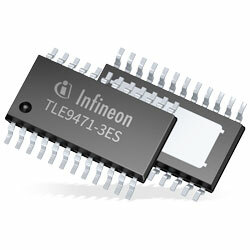 Infineon Technologies Lite System Basis Chips (SBC) Family provides high performance and optimises system cost for various automotive applications. The SBCs family are offered in two variants. The SBC with a low-dropout voltage regulator of 150mA and the DC-DC SBC with a DC-DC buck converter up to 500mA. Both variants are available as 5V or 3.3V output voltage option for microcontrollers, network transceivers, sensors and other peripherals’ power supply. The SBCs have an auxiliary 5V integrated low-drop voltage regulator with up to 100mA. The communication interface incorporates one CAN transceiver with Flexible Data-Rate performance up to 5Mbit/s according to ISO 11898-2:2016 (including Partial Networking option). The devices include diagnostic and supervision features, supporting ECU functional safety concepts like under-voltage monitoring, window watchdog with reset, fail-safe operating mode and fail-safe outputs. The entire family is hardware compatible and is also software compatible with the Mid-Range+, DC-DC and Multi-CAN Power SBC families (TLE926x and TLE927x). All the company’s SBCs are qualified according to AEC-Q100 and are designed to withstand the severe conditions of automotive applications.